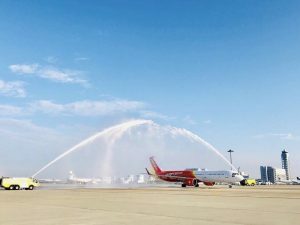 Vietjet officially welcomed its first flight connecting Hanoi and Osaka, Japan today at Kansai International Airport. The latest route for the airline connects the two cities of culture and tourism while meeting the traveling demands of both tourists and locals. On the inaugural flight, passengers were warmly welcomed with a traditional Japanese performance of ‘Kagami Biraki’. On the return to Vietnam, passengers were treated to witnessing Vietnamese folk dances when they landed. The Hanoi to Osaka route will operate on a daily basis with a flight time of four hours per leg. The flight departs from Hanoi at 1.40 am (local time) and arrives in Osaka at 7.50 am (local time). The return flight takes off at 9.20 am (local time) and lands in Hanoi at 1.05 pm (local time). This route also marks the first code-share service to take-off between Vietjet and Japan Airlines. Vietjet’s new service to Osaka brings the carrier’s total number to 64 with a network that spans over 11 countries. The airline will soon launch two other routes to Japan from Vietnam including Ho Chi Minh City-Osaka (Kansai) route from 14 December, 2018 and Hanoi-Tokyo (Narita) route from 11 January, 2019.